As a macro level expression of CSR, Saraswat Bank in association with Maharashtra Times created an intellectual platform entitled "Shikhar Maharashtra" with an objective of researching , debating and finding ways and means to deal with the many stubborn economic and social issues that Maharashtra faces today. 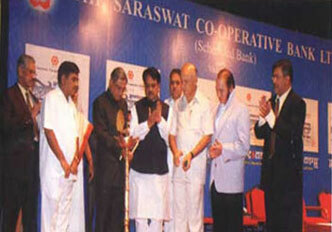 A gala opening of Shikhar Maharashtra was held on 27th July 2007 at Ravindra Natya Mandir, Mumbai. The program went on for two days wherein the social and political leaders from Centre and State participated. This inauguration of the forum of 'Shikhar Maharashtra" will pave the way for bringing to the table the daunting problems that our State faces today. It is proposed that at an interval of every three months, a major issue facing Maharashtra such as farmers' suicides, malnutrition, foeticide, scarcity of drinking water, famine and hunger, etc. is discussed threadbare on this nonpartisan platform by soliciting the participation of intellectuals and social workers who are active in the field and thereafter recommendations are made to the Government on the remedies that may ameliorate the situation and pursued thereafter. The RSS volunteers, who are associated with the publication "Vivek" are now engaged in bringing out chronicles on the lives of great men of all walks of life who have contributed to make Maharashtra what it is today. This is a laudable initiative, which documents the inspiring lives by thorough and serious research, and your Bank has sanctioned a sponsorship grant of Rs. 25 lakh to this project, the total cost of which is around Rs. 5.00 crore. 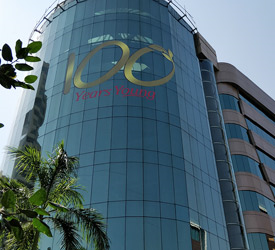 The project is known as "Shilpkaar Charitra Kosh". Late Annabhau Sathe was a peoples' poet-singer of Maharashtra. Some time back, the pitiable plight of his entire family living in indigence was depicted in newspapers. Your Bank's representative rushed to Sangli and in order to provide sustenance to the family, provided employment to the granddaughter of the late Lokshahir.